What kind of fragrance does a perfumer make for herself? When someone has smelled through the full range of olfactory materials and has the skill to compose something personal, what is it? In the case of Mandy Aftel of Aftelier Perfumes, it's a dense, sophisticated floral oriental built on real ambergris, a perfume she calls "the most extravagant in my collection." Fittingly, she named it Parfum Privé. A few years ago I saw Aftel speak in New York City. Her casual, down-to-earth appearance set her apart from many of the high-heeled, artfully coiffed perfume industry women I'd soon meet at the Fifi semi-finalists' awards breakfast. She was friendly but not pandering, and smart but not pretentious. My impression was she had nothing to prove, but was happy to share her love of natural perfumery if you were interested enough to listen. Aftel said her route to becoming a perfumer wasn't straightforward. She used to be a therapist for artists and writers, and, in part to understand their challenges, she decided to write a novel. A novel featuring someone who made perfume. In researching the book — tracking down ancient perfume manuals, learning about methods — the novel went out the window and perfume making with all natural materials took its place. Aftelier Perfumes was born. As fascinating as it was to hear Aftel, I have to admit I haven't always connected with natural perfumes. With the Gatling gun-like shower of new perfume releases, it was always easy to push the naturals to the side. Besides, I'm used to fragrances loaded with synthetics. I'm used to perfume that can be big, diffuse, long lasting, and cheap. I suppose listening to Mozart on 18th-century instruments might take some adjustment, too. Listening to Lady Gaga played by the same ensemble definitely would. I don't have a lot of experience with the blend of modern olfactory sensibility and natural materials. For me, Parfum Privé opened the door to a new appreciation of natural perfumes. Mandy Aftel created Parfum Privé in 2007 after obtaining some real ambergris. Parfum Privé also has notes of orange flower absolute, osmanthus, and ambrette. Its orange flower hugs Parfum Privé quietly and tightly, like the shellac on a piece of polished wood. Ambergris would be that wood. Not that ambergris smells like wood, but have you ever seen wood with such a smooth, satiny grain that it looks like it should be 3-D? That's the feeling I get from the ambergris — that satiny, shimmery depth. In the middle of the fragrance is the glamorous, tough-but-floral roundness of osmanthus. Something herbal dirties up the composition nicely. Parfum Privé is dense, and all its notes feel telescoped into a narrow bandwidth. That doesn't mean the fragrance is limited or boring. Instead, it's deep and subtle like a piece of good chocolate — with a similar earthy kick, actually. Chocolate looks, smells, and tastes like one thing, chocolate, but hold it in your mouth and you might taste smoke, caramel, wood, and more. Parfum Privé has a similar way about it. Parfum Privé has presence, too. I wore it last week when I met up with Trish from Scent Hive for lunch, and she noticed it right away with a comment on its "nice sillage". It has good sillage, that is, while it lasts. Which, sadly, is only about two hours. The way to go with Parfum Privé would be to invest in a solid of the perfume and apply it throughout the day. You'd have to be committed, though, because a solid is $400. The perfume is a relative bargain at $125, but that's $125 for 2.2 ml. To get a visual on a 2.2 ml bottle, imagine Barbie holding a Barbie-sized fifth of gin. It's that small. My dreams of spraying Parfum Privé with abandon will have to be filed away with the others involving Johnny Depp, villas on the Riviera, and vintage Balenciaga ballgowns. 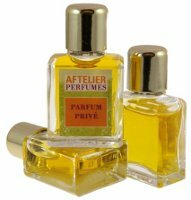 For information on where to buy Aftelier Parfum Privé, see Aftelier Perfumes under Perfume Houses. This perfume sounds nice, but I have to say I was laughing my A$$ off @ the article about the Fifi breakfast! Breakfast meetings with marketing people – NO F’ing WAY, someone should have warned you! Thanks for the laughs! I just kept thinking, all that good bacon, and these whippet-thin women won’t eat it…. It was a fun morning, though, and I had a good friend with me to talk about it with later. when I read : whippet-thin women, I could not stop laughing. Wat a wonderful expression!! And my favourite Andy Tauer won with Orange Star!!!! It’s not cheap, that’s for sure! But I guess real ambergris isn’t easy to come by, either. Opening the door to appreciation of natural perfumes is high praise, indeed, and I guess real ambergris artfully composed would do it. Now I really want to try Prive! Many natural perfumes do disappoint me (as do many synthetics, to be fair) for just that reason of the narrow band width, but Via del Profumo Mecca Balsam is definitely one of my desert island scents. That one’s such a great autumn scent, too. Makes me thirsty for Scotch. I just tried a few Afteliers for the first time in the last few months- and I am pretty impressed with all of the ones I have tried. I may not invest in a bottle any time soon- but I have already re-ordered samples of Candide and Cepes and Tuberose. Love them. I’ve only tried a few of them, but not the ones you mention–which are exactly the ones I want to try! They’re next on my list. “Gatling gun-like shower of new perfume releases” – brilliant! How is YOUR novel coming along, btw?? Great review! I’m *dying* to Parfum Prive, but…. This is a line that I’ve been interested in for some time. I think Mandy is extremely talented. She sure seemed like a terrific person. You know how you see some people and just know you’d get along? That’s how I felt. I did an overhaul on my novel and just started querying on it this morning, in fact. Thanks for asking! I have a good friend out in Washington who is at the same part of the process with her novel! Thank you, and I wish your friend good luck, too. Blast! I just put in my first sample order of Aftelier Perfumes last night and didn’t include this one! (I got EdP and perfume samples of Candide, Cepes and Tuberose, Honey Blossom, Tango and I think Shiso.) Great review, thanks. Like you, with a few exceptions, I’ve always had trouble enjoying all-natural fragrances or even e-tailer scents in general. I’ve always meant to get to Mandy Aftel’s scents, but besides the expense of the samples themselves, the shipping to Canada used to be outrageous ($30 or something). I had tried Tango several years ago and remember it was fabulous and very different and I really enjoyed her letters back and forth with Andy Tauer (posted on Nathan Branch’s blog), so I’m really looking forward to the samples arriving. Isn’t Mandy nice? She was so forthcoming when I went to her studio last year. I have a dab of this but haven’t really worn it yet. I have minis of Cepes and Honey Blossom, and a couple bottle oils, along with several other samples. She does really nice work. You went to her studio–wow! How fascinating. The perfume itself is a world of interest, but I also love how she determined her own direction in life. Angels thank you so much for this wonderful review of Parfum Prive — a perfume that holds a special place in my heart. You really captured it for me. Thank you so much for taking the time to write about my work in this vivid and generous. The four main essences (unfortunately each one around $10,000 a kilo) orange blossom absolute, ambergris, ambrette seed and osmanthus locked together to make the shimmering core of this perfume and from there I just embellished slightly here and there. Thanks for commenting! I know I didn’t do PP justice. I wanted to compare it to a sable wrap–you know how sable holds all those different colors of chocolate and golden fur?–but I couldn’t get it right, and, frankly, I don’t have a lot of experience with sable wraps. But it seemed appropriately luxurious and warm. My nose isn’t particularly keen, but I swear there’s something earthy and herbal in Parfum Prive, too. What could it be? On a side note – the deYoung museum in SF is running an exhibition of Balenciaga couture, Angela. Come on down and see your fantasy in the flesh (or fabric, rather). I would love it! They’re such gorgeous, gorgeous dresses. The structure, the sensuality, the intellect of them. Have you seen the exhibit? I’ve already seen it once and will go back for many repeat visits before the end of its run (July 4). Let me know if you make a flying visit down here – I’m a museum member, so you can come in free as my guest! I wish I were going down there! If by some miracle I do get to SF, you can be sure I’ll look you up. There really isn’t anything herbal in Parfum Prive but there is some antique (over 100 year old) sandalwood and some oppopanax, there are some spices, nutmeg absolute and pimento leaf (not berry) and pink pepper and a splash of light citrus. “100 year-old sandalwood”!!!! The combination of real sandalwood and ambergris with Mandy’s exquisite shadings with the other ingredients makes wearing Parfum Privé like wearing the history and future of perfume all at once. Thank you! It’s wonderful even to hear the names of the essences you added. 100 year old sandalwood is astonishing. I have been collecting old sandalwood for many many years — it has such a buttery smooth aroma fits like a lock and key with the ambergris. Oh my goodness! Seeing Aftelier post here, is like running into your favorite musician! What a wonderful treat to log on and see you. Melody at the Ft Worth Neiman Marcus introduced me to your fragrances, and I am forever greatful. And thank you for producing smaller bottles. Now choosing which one to purchse, has become easier. And I can pick up several, instead of choosing only one. Have you tried Parfum Prive yet? I’d love to know what you think of it. oh my I have made a major faux pas! However I have discovered wonderful new scents! No faux pas here, don’t worry! Mandy and her first perfume book was my gateway into perfume generally, so I have a lot to be grateful to her for. Her materials are amazing, and your description of the density and dreamy subtlety is truly beautiful. Yes, thank heavens there are those smaller flacons available these days. Your Gateway Perfumer! And worthy of it. Parfum Prive smelled wonderful on you, and I have worn it several times since then. At this rate my little sample will be long gone in no time. I’m going to hide the rest of my Parfum Prive so I don’t use it up too fast.